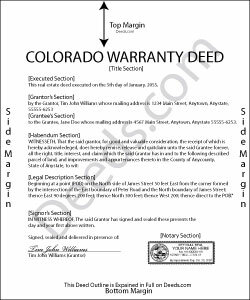 A warranty deed in Colorado can be used to facilitate a conveyance of real estate in fee simple. The Colorado Revised Statutes, section 38-30-113, provide a short form for a warranty deed with covenants on the part of the grantor. The use of the phrase "warrant the title" in a warranty deed implies the following covenants from the grantor to the grantee, his heirs, and assigns: (a) That at the time the instrument was made, the grantor was seized of an indefeasible estate in fee simple in and to the property described in the deed and has good right and full power to convey the same; (b) That the property was free from all encumbrances, except as may be stated in the instrument; and (c) That the grantor warrants to the grantee, his heirs, and assigns the quiet and peaceable possession of the property and will defend the title thereto against all persons who may lawfully claim the same (38-30-113). A warranty deed must include the grantor's signature, which should also be acknowledged. If executed in Colorado, a warranty deed can be acknowledged or proved before any of the officers listed in 38-30-126. Section 38-30-126 also lists the officers authorized to perform acknowledgements if the deed is executed out of state. No officer authorized to take acknowledgments of deeds should take or certify acknowledgements unless the person making the same is personally known to the officer to be the person he is stated to be in the deed or is proved to be such person by at least one credible person known by the officer (38-35-101). The recording act in Colorado is a race-notice recording statute. An unrecorded warranty deed is not valid against any person with any kind of rights in or to such real property who records first and those holding rights under such person, except between the parties to the deed and those having notice of it prior to the acquisition of such rights (38-35-109). Warranty deeds should be recorded in the office of the clerk and recorder in the county where the property is located in order to provide constructive notice of the contents.